The ratings widget for each episode on the guide is now complete! Thank you for your patience, it took a while but there are now pretty star-like outlines awaiting your clicking on the RM episode guide. 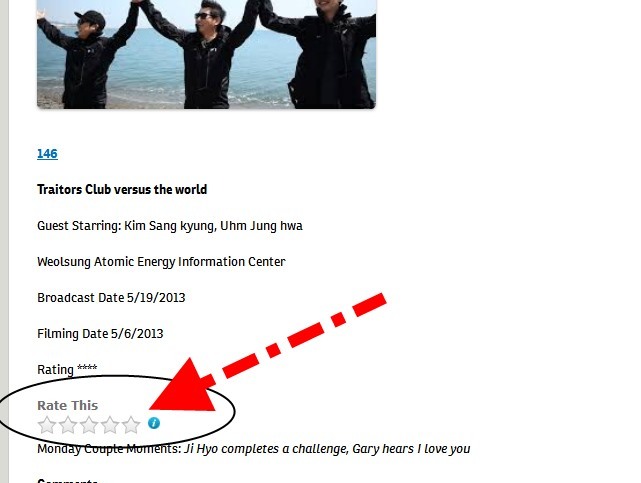 To rate an episode click on the number of stars that you would like to give it (from one to five), the score that is displayed is cumulative – so pretty much as a collective fan base we are rating episodes for each other. Go us! As I have added ratings there have been some surprises for me – such as how much I seem to differ from popular opinion. But these type of surprises are nice surprises, after all they make me consider what I may have overlooked. So in celebration of finally (seriously, I feel like a slacker on this task) adding ratings to every episode I give you… Stone Cities favorite Running Man GIFs. Cheers!